For guys only: which IZ character would u date? Gaz atau Tak? Should we add lebih variety to this club besides invader zim? Like JTHM,Lenore,etc? sorry that this has nothing to do with invader zim, but u guys r nice so i'll ask u: which profil pic is best? If invader Zim comes back to anda think we will have the "Bloody Gir" issue again? pilihan fans: Yeah they'll sneak it in somehow. Do anda want me to draw anda atau your character as an invader zim character? Did the leader of the Irken Empire just ask little old me on a date? That couldn't be right why on Earth atau Irk would he ask me out? I was just a human that sang at a Club on his ship. He could have any Irken women he wanted, why ask me? I walked to my room in shock and laid on my tempat tidur just staring off into luar angkasa literally. Its been a few mouths since Earth had fallen under Irken rule. It was taken over oleh a small Irken named Zim and two humans who were outcast. Dib and Gaz I believe that's what their names are, I didn't blame them. They were outcast, and I understood that better than most people did. My family didn't understand me and why I wasn't huge on religion like them, my friends used me atau back stabbed me, boyfriends broke my jantung atau cheated on me. Then only things that I have are music, buku and my dreams. I saw the demon prince who wanted me to be his damn bride. I saw swords on the dinding and I graphed two one for Dib and one for me. I rather die that be his wife! Zim was on his labah-labah, laba-laba legs with in seconds. "I don't think so beast!" Zim berkata with pure hate. Authors note girsmurf22 helped out on this anda rock sis! I remember Ms. pahit turning in to demon threating to kill my Dibby and Zimmy. Im sorry i wasn't on yesturday, but something anda all have been waiting for happend. 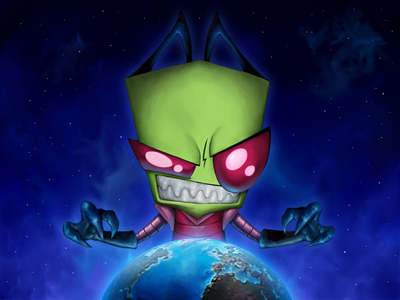 Why did the Almighty Tallest send Zim to Earth and give him annoying Gir?